Who cares for the seniors? In early 1996, a prolonged cold spell in Hong Kong led to the death of more than 150 unattended senior citizens, a tragedy that raised public concern for the safety of elderly people. Due to medical advances today, people are living longer and the ageing population is increasing. The number of older people living alone in Asia is also rising due to a shift in social and family values, indicating an increasing need for total care services among those aged 65 and over. Through information technology and communication systems, the Senior Citizen Home Safety Association (SCHSA) aims to provide senior citizens and those in need with 24-hour lifeline assistance. In addition to emergency and notification services, it also includes social services, social support networks and consulting services for people with elderly family members requiring special arrangements. The SCHSA 24-hour “Personal Emergency Link” system caters to the elderly living alone in Hong Kong. Subscribers simply press a remote trigger on their alarm system to contact an operator, who identifies and assesses their needs. In case of an emergency, staff will notify ambulance services, the appropriate hospital and family members to ensure prompt assistance. The “Elder Ring Hotline” is attended by professional social workers and trained volunteers, and provides telephone contact, emotional support, short-term counseling and referral services free-of-charge. To date, SCHSA has trained and mobilized +1.200 volunteers, who help with the Elder Ring Hotline, home and hospital visitations, and blanket deliveries. 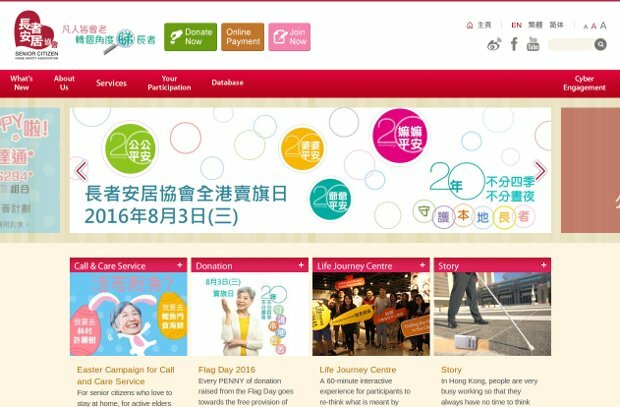 In responding to the emerging demand for home support and care service, the association has also started Easy Home Service, another Social Enterprise Project, to render on-demand home support and care service to hundreds of the needy elderly and families. More than 1.000 middle-aged Easy Home Service Teammates have been trained to address the required services of those subscribers.